It's the time of year for New Year's resolutions. If you're like I am, five days into the new year and I've already tossed my resolutions to the wayside. I almost tried to follow them. I had a bad cold, my couch felt oh so lovely, and the cupboards were stuffed with leftover Christmas candy. It was too easy to pretend I hadn't made them in the first place. Excuses, as opposed to resolutions, are surprisingly easy to make. Last year, after studiously making my resolutions, I actually followed them. I did eat healthier over the past year, choosing apple slices over potato chips and finding a way to keep my food groups more balanced. I took a photography class, but I think I taught myself more in the end. I found my place working in a bakery (and I certainly didn't stop baking). After reflections over last year's resolutions, I give myself an A+. This year, however, not so much. I always feel that if I don't start following my new resolutions exactly on the first day of the new year, I never will. And sadly, more often than not, this is true. Last year is the only year I've successfully managed to both follow and keep my resolutions. Perhaps it's not too late to make a set of January 5th resolutions? This year I resolve to eat healthier. Not just swap apple slices in for potato chips, but choose healthier grains (quinoa, brown rice, whole wheat pasta) over their white, bleached counterparts. I want to eat less salt and less processed foods without losing any of the flavor. I want to want to choose the healthier option instead of begrudgingly accept it. Also, I hope to keep some room in that new diet for dessert. No diet is complete without dessert. I want to learn how to cook. This resolution may sound silly to you (after all, I do run a food blog), but the truth is that I have no idea what I'm doing when it comes to using the stove top instead of the oven. I can't cook meat properly (dry chicken anyone? ), sauces are a foreign concept to me, and I am absolutely useless when it comes to using spices. Except for a few delicious favorites, most of what I invent in the kitchen isn't worth revisiting. If I'm going to keep my resolution to eat healthier, learning to cook comes hand in hand. Since I do believe we are all allowed a "fun" resolution, this year I would like to learn French. Though I lived in Quebec for 6 months, I never quite picked up the language, instead reverting to English whenever possible. As a result, the French language has become a bit elusive for me. French is something I wanted to learn ever since I've moved back home, but haven't had the time until now. How else am I going to understand the French cookbooks I bought? To start off the new year, I thought a new and more unusual recipe would be fitting. 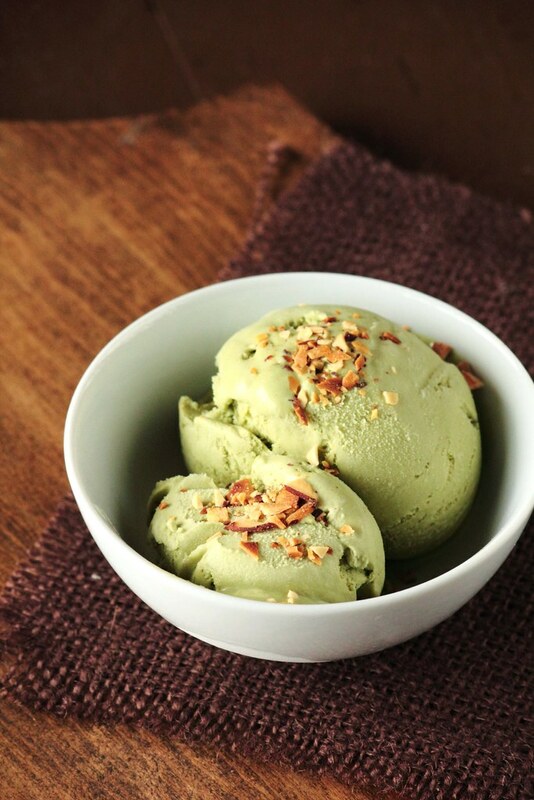 Though green tea ice cream is popular in Japan and parts of Asia, it's uncommon in the United States. 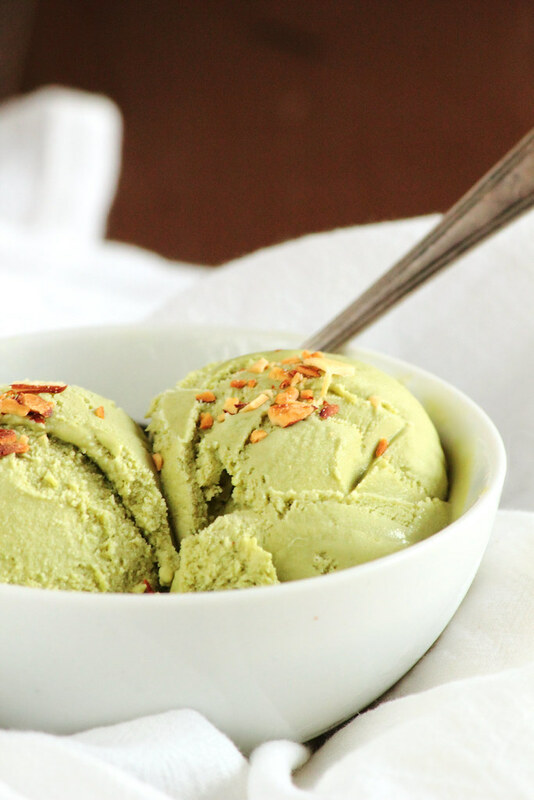 I paired my green tea ice cream with a bit of coconut to make it more familiar and topped it with toasted almonds to round out the flavors. It's different, it's exciting, and I am in love with the pure, green tea color. 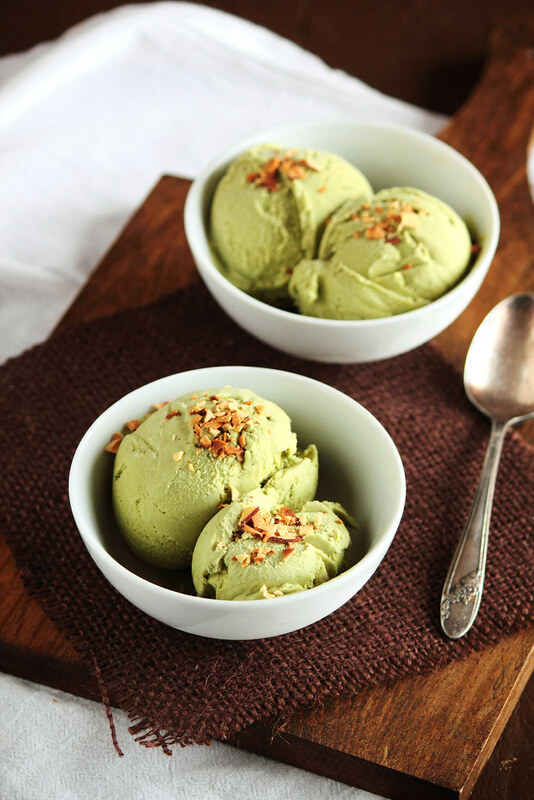 Green tea powder (or matcha powder) can be tricky to find unless you know where to look. Living in the heart of the Midwest, it took me a solid year to track it down. Asian supermarkets will be your best bet and health food stores often carry it. I found my green tea powder at a local tea shop. Like always, if all these options fail, matcha powder is always available on the internet. 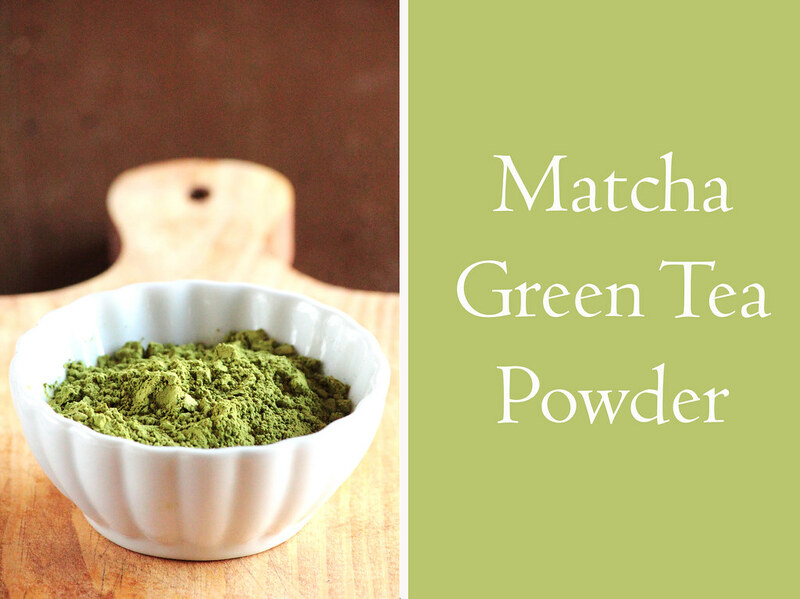 Green tea powder is great for baking, making green tea lattes, or brewing a simple, but elegant cup of tea. 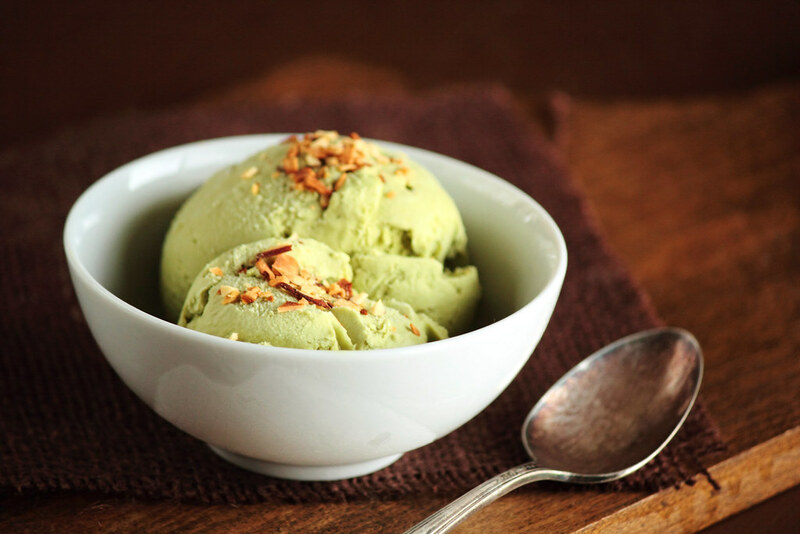 Green Tea Coconut Ice Cream is fresh, tasting vividly of green tea with just a hint of coconut. 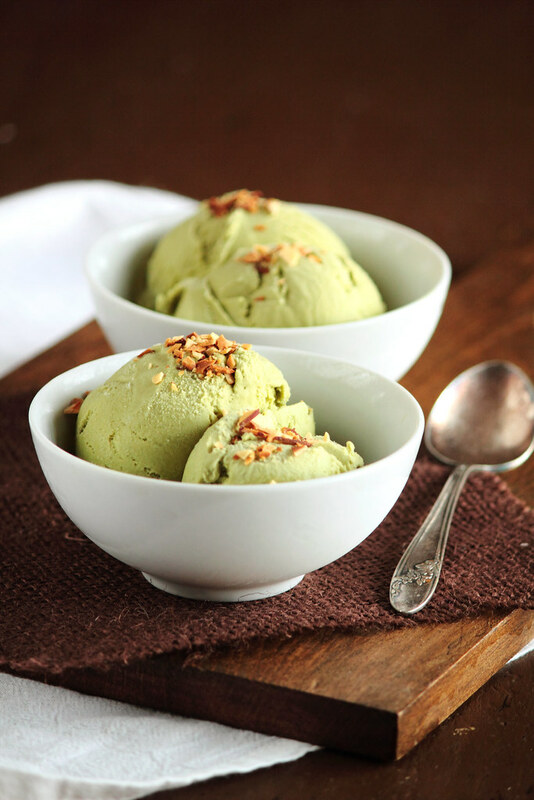 The recipe is easy to follow (simply blend all the ingredients together in a blender), but it does require an ice cream maker to give the ice cream that sought after, smooth quality. I topped my ice cream with toasted almonds and I strongly recommend you do the same. 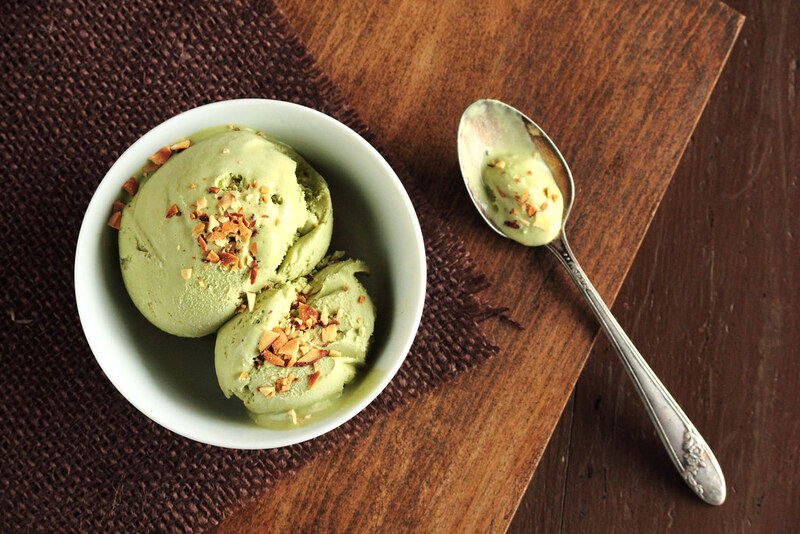 Toasted almonds and green tea complement each other in a very unexpected, but delicious way.